Take I-75/85 Northbound: I-75 joins I-85 in Atlanta. Proceed from I-75 to I-85 North. Stay on I-85 to Clairmont Road, exit #91. After exiting, follow the signs to Decatur. Drive 4-5 miles on Clairmont Road to North Decatur Road. Turn right onto North Decatur Road. Proceed one mile to Clifton Road. Turn right onto Clifton Road. The hospital is 100 yards on the left. Take I/85 Southbound: Exit Clairmont Road, exit #91. After exiting, follow the signs to Decatur. Drive 4-5 miles on Clairmont Road to North Decatur Road. Turn right onto North Decatur Road. Proceed one mile to Clifton Road. Turn right onto Clifton Road. The hospital is 100 yards on the left. Parking decks are located just off Clifton Road, directly behind Emory Clinic Building B. Valet parking is available on the south side of the hospital 24 hours, 7 days a week. Valet charges cover both parking and valet service. 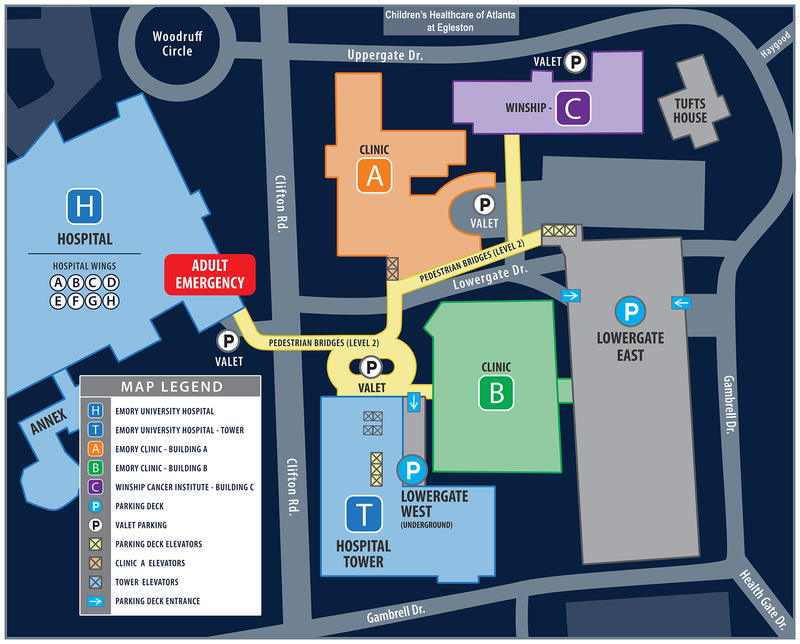 If you need to park at Emory University Hospital for several consecutive days, you might be interested in our long.-term parking cards. The cards are good for five consecutive days and provide unlimited in/out privileges (self-parking only, not valet). The cards are $40 and can be purchased by cash, check or credit card (no refunds or exchanges), Monday–Friday 9 a.m.–5 p.m. in the Emory University Hospital Admissions Department, room A-211. For more information, please contact 404-712-5619.